Visual Studio Code>Other>filesizeNew to Visual Studio Code? Get it now. 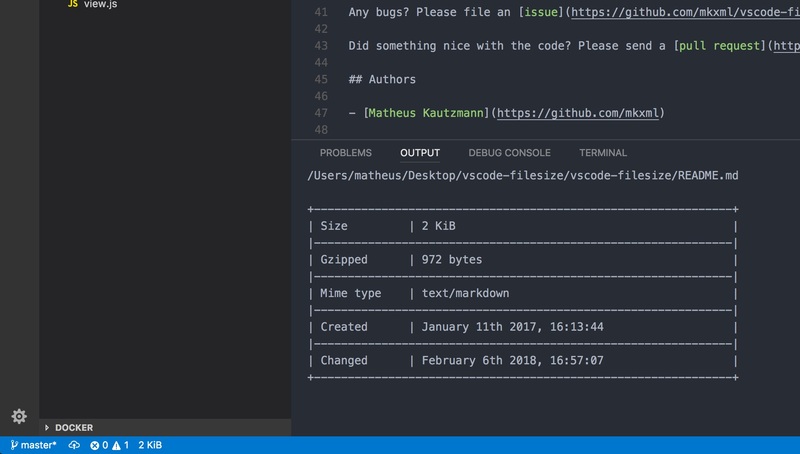 This package is intended for use with the Visual Studio Code editor and it displays the size of the focused file in the status bar of the editor. Bonus: If you click on the status bar component it will display more information about the file! In VS Code, press Ctrl-P or Cmd-P (Mac) and type in ext install vscode-filesize. Click install in the left bar. Once the extension is installed you will be prompted to restart Visual Studio Code. Or you can just search for filesize in the extension search bar inside the editor. To open the detailed view for the current file in focus you can just click at the size in the status bar or use Crtl-shift-' or Cmd-shift-' if you are on a Mac. useDecimal: set to true if you want your size data to be displayed according to the SI unit system or leave it at false to use IEC's format (default). use24HourFormat: set to true to use the 24-hour clock, set to false to use the 12-hour clock. Default is true. showGzip: set to true to show calculated gzip size in the detailed info view. Default is true. You are welcome to send any issues or pull requests. 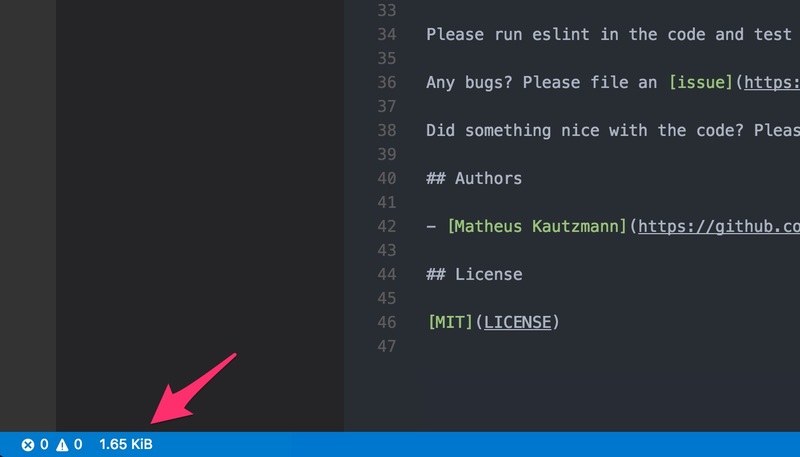 Please run eslint in the code and test it with Visual Studio Code before sending changes. Any bugs? Please file an issue. Did something nice with the code? Please send a pull request.